John Frank Tesh (born July 9, 1952) is an American pianist and composer of pop music, as well as a radio host and television presenter. His Intelligence for Your Life radio show airs on nearly 300 stations, and is syndicated by Teshmedia in the U.S., Canada, and the U.K. In addition, since 2014, he has hosted Intelligence for Your Life TV with his wife Connie Sellecca. The syndicated TV program airs on 174 stations that cover 93% of the potential U.S. television audience. Tesh was born in Garden City, New York, on Long Island, the son of Mildred (Bunny), a nurse, and John F. Tesh, a textile chemist. He graduated from Garden City High School in 1970. Playing piano and trumpet from the age of six, he studied with teachers from The Juilliard School and was named to the New York State Symphonic Orchestra in high school, while also playing the organ in a rock band. Tesh studied communications and music at North Carolina State University. He was also a member of the varsity lacrosse and soccer teams. While at North Carolina State, studying physics and chemistry, he took a TV and radio course, and in 1974, Tesh worked part-time reading later the news for Rick Dees at WKIX-AM/Raleigh in 1974. His roommate, Bill Leslie, anchor at WRAL, helped him get into the radio and TV field. While in the area, Tesh worked as a news anchor in Raleigh, Orlando, Nashville, then moving to WCBS-TV in New York; this portion of his career spanned 12 years. Tesh also served as a sportscaster for CBS and later NBC, anchoring events such as the Tour de France bicycle race from 1983 through 1986 (Tesh has the distinction of being the anchor for the first American broadcast of this event), the US Open, and gymnastics at the 1992 and 1996 Summer Olympics. Tesh hosted the short-lived One on One with John Tesh talk show in 1991–92 on NBC daytime, and co-hosted the show John & Leeza From Hollywood with fellow Entertainment Tonight personality Leeza Gibbons from 1993–94, also on NBC daytime. In 2014, Tesh returned to syndicated television in the series Intelligence for Your Life TV, based on his radio show. Tesh appeared in "The Icarus Factor", an episode of Star Trek: The Next Generation, playing a Klingon warrior. He also appeared as himself in a 1987 episode of the daytime serial Santa Barbara. In 1987, Yanni was putting together his first touring band to promote his album Out of Silence, as well as selections from Keys to Imagination. Being good friends, Tesh asked Yanni if he could join the band as keyboardist along with Joyce Imbesi and drummer Charlie Adams, as he'd never been onstage for a live performance, and he needed the experience. Despite already having a full-time job with Entertainment Tonight, and the long hours of rehearsal for the band, he did very well, although he did only one tour with Yanni, playing in about 12 shows, including the "1988 Concert Series", before being replaced by Bradley Joseph. Later, Yanni helped Tesh get his first recording contract with Private Music. 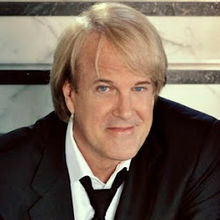 In the 1990s, John Tesh was credited with the theme music to Bobby's World, hosted by Howie Mandel, and the NBA on NBC theme, known as "Roundball Rock". Tesh composed the NBA on NBC theme after an idea hit him while traveling. In order to recall his idea at a later juncture, Tesh recorded the initial beat on his answering machine, leaving a message for himself. The theme was used for the NBA on NBC before the network stopped carrying NBA games following the 2001–02 season (as well as an electric guitar-driven spinoff that was used on NBC's WNBA telecasts from 1997 to 2002), though NBC would revive the theme for its basketball coverage during the 2008 Summer Olympics. In 2008, he put out a piano gospel dance DVD called Alive: Music & Dance. It combines Tesh's music, big gospel choirs, and hip-hop dance. Tesh currently has a nationally syndicated radio show called the John Tesh Radio Show, which typically airs on adult contemporary, classic hits, Christian and soft rock radio formats. The music is interspersed with various factoids and other information Tesh considers useful to listeners, often with topics such as health and well-being. These factoids are called "Intelligence for Your Life", played on radio stations across the United States and Canada, and the Armed Forces Network. Select pieces of "Intelligence for Your Life" are broken up and distributed in vignette form to other radio stations (including talk radio formats) and for use on morning shows. There is also a three-hour weekend show, "Intelligence for Your Health", launched in 2010, hosted by Connie Sellecca. Across all of its versions, Tesh's radio programs reach listeners across the United States, Canada, and United Kingdom, placing it on the list of most-listened-to radio programs. Tesh's main rival is Delilah, and these two shows are sometimes aired in the same market on competing stations. The show started as a weekend show in 2000 on Clear Channel’s KKDJ-FM/Bakersfield and then a few other stations, expanding to a daily version in 2003. The program was originally syndicated by Westwood One under the name On the Air with John Tesh, albeit with a slightly different format. It is produced by Tesh with a staff of 35 and still distributed by syndicator Westwood One. In September 2016, the partnership with Westwood One was renewed in a new multi-year agreement. At the time, Westwood One indicated that it was airing on 280 radio stations. In late 2014, a television version of these factoids, Intelligence for Your Life TV, debuted in syndication to local stations. In April 2016, the TV program was seen on 174 stations. The series also features health segments hosted by his wife, Connie Sellecca, based on her own radio program, "Intelligence for Your Health". Tesh also authored a book, Intelligence for Your Life: Powerful Lessons for Personal Growth, in 2008, reprinted in 2012 (ISBN 0849964636, publisher Thomas Nelson). Tesh has been married to actress Connie Sellecca since 1992. They have one daughter together named Prima. His wife also has a son named Gib, with actor Gil Gerard, who now appears on some of Tesh's radio and TV programs. Tesh and Sellecca reside in Los Angeles. In the 70s, he also briefly dated Oprah Winfrey. Tesh is a Christian. He was raised a Baptist and was involved in the church during his youth. He played organ, sang in the choir, and went to church camp. He became inactive in the church during his adult life, but became involved again after his future wife introduced him to pastor Louis Lapides. Since then, he has written and performed Christian music. In 2018 John Tesh was inducted into the North Carolina Music Hall of Fame. In 2007, Tesh won the Syndicated Personality/Show of the Year award by Radio & Records magazine for his radio show. Other finalists included Delilah, Blair Garner, Steve Harvey, Kidd Kraddick, and The Lia Show. Tesh was nominated in 2003 for the Grammy for "Best Pop Instrumental Album" for Power of Love. John has also earned three gold albums, six Emmys for his sports themes, and a Keyboard Magazine Award. ^ "John Tesh and Connie Sellecca". Radio Ink. Streamline Publishing, Inc. Retrieved February 26, 2017. ^ a b "John Tesh Discusses His Faith and Music". CNN.com. Cable News Network. April 11, 2000. Retrieved August 14, 2012. ^ a b PR Newswire press release: ""Intelligence For Your Life" TV To Launch On September 15, 2014, Set To Air On 130 Stations Into 83% Of U.S. Homes", July 29, 2014. ^ . www.imdb.com, July 19, 2013. ^ Yanni; Rensin, David (2002). Yanni in Words. Miramax Books. pp. 123, 202. ISBN 1-4013-5194-8. ^ Gayomali, Chris (May 26, 2011). "Watch: How John Tesh Wrote the NBA's Iconic Theme Song". time.com. Retrieved March 12, 2013. ^ John Tesh Finds His Groove. NewsMax.com, March 15, 2007. ^ "John Tesh and Connie Sellecca". Radio Ink. Streamline Publishing, Inc. April 2016. Retrieved February 26, 2017. ^ Polsky, Jana (September 26, 2016). "MULTI-YEAR AGREEMENT FOR "INTELLIGENCE FOR YOUR LIFE" RADIO AND WESTWOOD ONE". Westwood One. Westwood One. Retrieved February 26, 2017. Westwood One and Intelligence For Your Life with John Tesh, Connie Sellecca and Gib Gerard has renewed their partnership in a new multi-year agreement that will bring the Intelligence for your Life radio programs ... Westwood One has exclusively represented the programs for 15 years. ^ "for Your Life: Powerful Lessons for Personal Growth". Goodreads. Goodreads Inc. 2016. Retrieved February 26, 2017. ^ "John Tesh". WRAL-FM. WRAL-FM. Archived from the original on August 13, 2012. Retrieved August 14, 2012. ^ "About John". Official John Tesh Website. Archived from the original on April 10, 2008. Retrieved April 27, 2008.